Our range of friability testers are handmade by ERWEKA, so durability, reliability and quality are second-to-none. These friability testers will last you a long time and are hands-down the better investment than other budget options available on the market. If you would like a quote for one of our friability testers, please get in touch, we are happy to help. 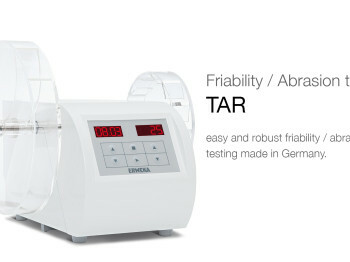 The friability tester TAR series is a USP /Pharm.Eur. / JP compliant ERWEKA unit for testing friability and / or abrasion.